Strengthening exercises – Using machines, resistance bands, or your own body weight (squats, lunges, and push-ups). Low-impact aerobics training – This training will increase your heart rate, while also taking it easy on your joints. Pain relief exercises – These exercises target the areas you are experiencing pain so that you become stronger and more flexible. Stretching – Consists of gentle stretching. Your therapist will make sure that you’re warmed up and do not stretch too far. Physical therapists are not only experts in treating pain, but also at finding the source of the pain. These professionals will look for areas of weakness or stiffness that could possibly be adding stress to the area that hurts. 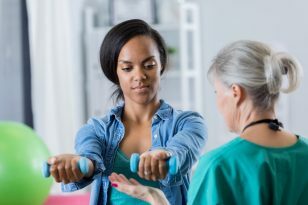 In managing chronic pain, it is important to understand the underlying cause of pain and treat it based on the individual case, using either strengthening and flexibility exercises, manual therapy, posture awareness, or body mechanics instruction. Manual therapy is a specialized form of physical therapy that is delivered using the hands instead of a machine or device. It is a hands-on treatment of muscles, ligaments, joints, and tendons and encompasses a broad group of sophisticated techniques performed with the hands and by trained physical therapists. How is Manual Therapy performed? Manual therapy is performed by a uniquely trained physical therapist by using their hands to put pressure on muscle tissue and manipulate joints. This technique is done to attempt to relax tense muscles and restricted joints in order to decrease back pain caused by muscle spasm, joint dysfunction, and muscle tension. One of the techniques to employ manual therapy is to use soft tissue work. This technique applies pressure to the soft tissue of the body, such as the muscle, and helps to relax the muscle, increase circulation, break up scar tissue, and ease the pain in the soft tissue. Another technique used is mobilization/manipulation. This specific technique uses measured movements of varying speed, force, and distances to twist, pull, or push bones and joints into position. Manual therapy’s main purpose is to decrease pain and increase function. This technique, to reduce pain, is also proven to get you better, faster, as we work individually with patients to meet their needs. This translates to being able to return to work sooner, less out-of-pocket expenses, and avoiding taking any extra medications.